A set of gates designed by Design Products alumnus Max Lamb, have been installed on the Battersea campus between the Sackler Building and its new neighbour the Woo Building, which opens today. 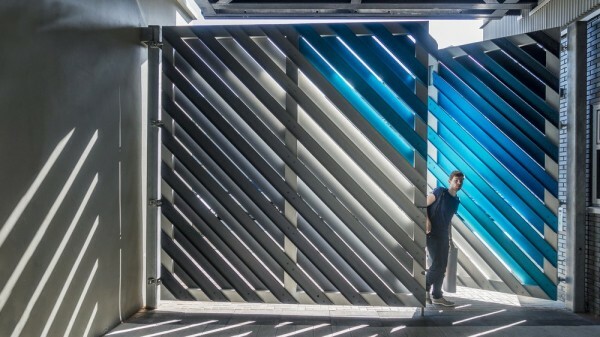 The gates, which will allow both pedestrian and vehicle access, are made from anodised aluminium, coloured to form a striking gradient from light grey, through vibrant turquoise to deep shades of navy. The gates will be in constant daily use and are required to span a gap over five metres wide and four metres tall. While in architectural terms this is not large scale, in terms of the human it is formidable. They are the first project Lamb has undertaken at this size, and for a setting that is both exposed to the elements and very public. Responding to the practical requirements of the brief, Lamb chose to work with aluminium; a lightweight yet structurally strong material, which is also highly durable and does not easily corrode. 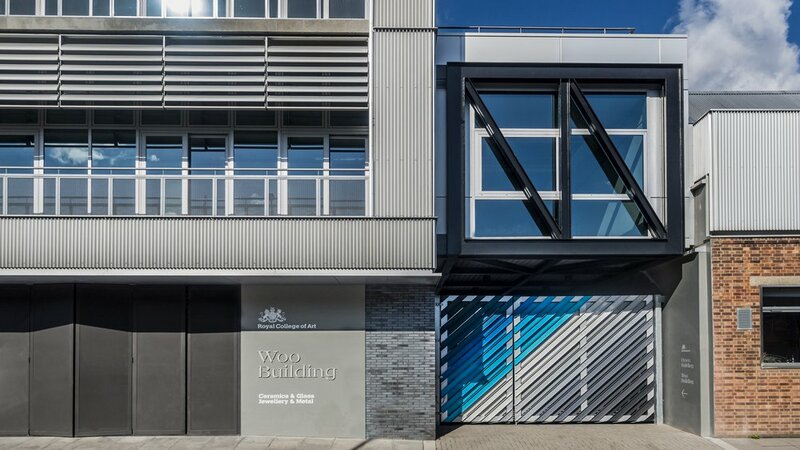 The choice of aluminium both echoes architectural details of the buildings that surround the gates, as well as the activities which will be taking place within the new Woo Building. Opening on 30 September, the Woo Building houses two programmes from the School of Material: Ceramics & Glass and Jewellery & Metal. This new addition to the Battersea campus will provide a centre for world-leading research and teaching, alongside technical facilities to foster innovation for future generations of applied artists. The arrival of these applied arts programmes, which will join the School of Fine Art already located at the Battersea campus, signifies the cross-disciplinary approach found throughout the college, acknowledging both the importance of specialisms and the way that artists, makers and designers are influenced by the practices of others. Having researched different forms of aluminium industrially available, Lamb choose to work with two forms of the metal, which could be cut to the required, size and bolted together. He describes his final design for the gates as being like a big Meccano kit. The gates are formed of a frame made from lengths of box section, which is hidden by diagonal cladding formed from lengths of extruded aluminium known as channels. To construct the gates, Lamb worked closely with a fabricator, Flux Metal. Usually he prefers to take a hands-on approach to design, and was challenged by having to make the initial plans for the gates on paper. However during fabrication he was able to spend much time on site, adapting and modifying the design as it was being made. 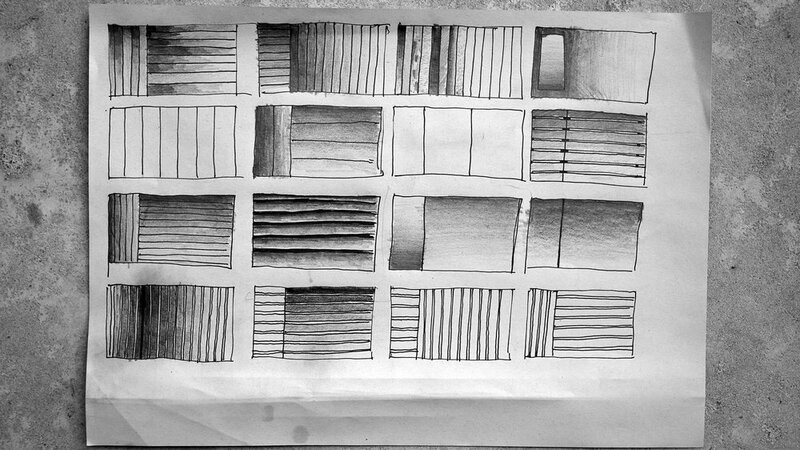 Initially, Lamb envisioned the cladding forming a combination of horizontal and vertical lines, however he realised that placing them at 45 degree angles would both strengthen the structure and allow water to run off it more easily. 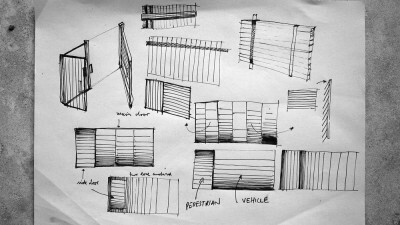 When deciding on the aesthetic of the gates, Lamb wanted to retain a truth to the material he was using. 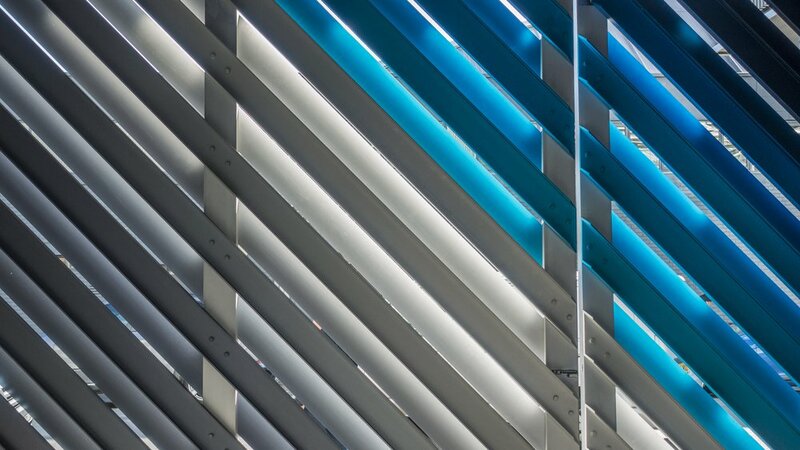 To achieve this, he opted to use anodised aluminium; a treatment that creates a thicker layer of oxide on the metal’s surface, which can be dyed due to its porosity. Rather than hiding the metallic qualities of the aluminium, as coating or painting it would, anodising it accentuates them. The gates are distinct from much of Lamb’s previous work, which predominantly focuses on furniture design. However a familiarity can be seen in his Anodised Table from 2009, through which he also explored the unique qualities of anodised aluminium, and his Flat Iron Chair, made in 2008, that was also realised with the assistance of Flux Metal.